The investment management industry is increasing its spend on sales, marketing and client servicing. 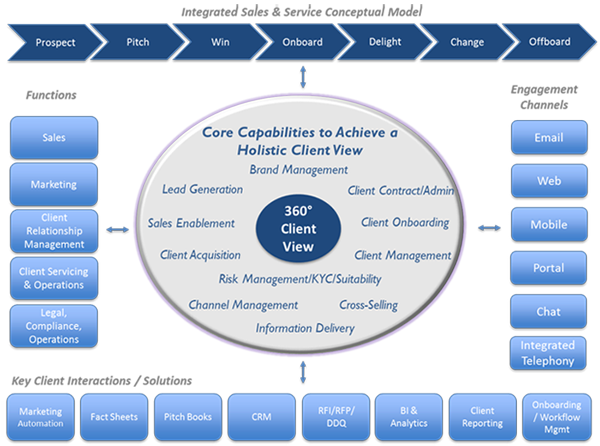 Recognizing that solutions are too often assessed and implemented in a siloed manner without an end-to-end client engagement perspective, Olmstead has developed an integrated Sales & Service model to help guide client experience investments. Client Reporting, Sales Enablement, CRM, and Client Portal projects are as much data projects as they are software projects. They are typically plagued by data readiness issues, which in turn lead to elongated implementation timeframes and value compromises. Olmstead has developed a set of tools and methods to accelerate time to go-live, de-risk projects and elevate quality. Click here to learn more about Olmstead's Data Management & Analytics services. Do we have a clear definition of the client experience? Can we make our client service a competitive advantage? Do our clients truly want anytime, anywhere access to their data? Have others appointed a CX leader to solution across functional silos? How can our digital investment better identify needs and leads? Is there a single reporting solution for my sales enablement and client servicing needs? 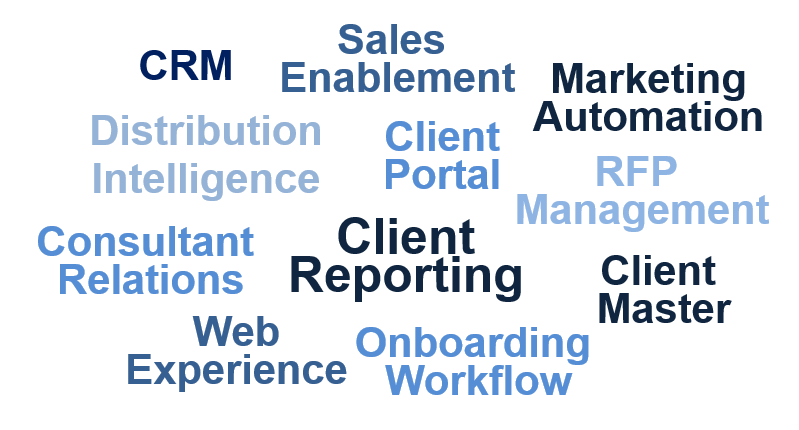 What are the pros and cons to CRM as a workflow centerpiece? How do we optimize CRM usage? Must a CRM implementation be a multi-year, multi-million $ effort? Where should our 360 degree client view reside? How do we break down internal walls amongst our client touchpoints? How far are we from self-service client reporting? Olmstead's client needed to upgrade their client reporting capability in order to decrease time and energy spent collecting, aggregating, and processing data in report production. However, before selecting a client reporting solution, Olmstead first advised through a data centric approach, a strategic data solution and architecture that would support an integrated client service model for scalable growth. This resulted in the opportunity to architect an enabling solution that provided underpinnings for not just client reporting, but the broader Client Engagement suite of CRM, Pitchbooks, Client Master, and a digital / web presence. Our client was looking to build and integrate reusable data sets and tables from data sources (Eagle PACE and internal warehouse) in preparation for a Seismic and Client Reporting implementation that would support Sales & Marketing. Olmstead was responsible for the data integration and helped to streamline processes used to create marketing material and reports that were previously managed manually through spreadsheets and PPT. Olmstead facilitated the data preparation and readiness for the Sales Enablement solution by de-siloing and taking inventory of data used in pitch books, fact sheets, strategy summaries, client reports, and meta-data. The result was centralized data being available for future projects including CRM and the Client Reporting initiative. Olmstead was engaged to manage all aspects of the project including report requirements, report design, report specifications, data sources, data mapping, data integration, testing and remediation. Olmstead assumed responsibility for the program and while managing to tight deadlines worked closely with the business, systems and the vendor to ensure nothing was overlooked. Stephen is CEO of Olmstead Associates. He also leads Olmstead's Client Engagement capability, helping investment managers with communications and information delivery solutions across their client lifecycle. He has 25+ years as a management consultant and financial technology executive, helping global financial markets firms of all sizes define and achieve their business objectives. Regarding our client's client experience, he drives Olmstead's services, considering all client touchpoints when devising client engagement operating models and integrated sales and service solutions. Stephen held senior positions at Andersen Consulting (now Accenture), PwC, and Arthur Andersen, where he was the partner-in-charge of the New England financial markets business consulting practice. Prior to Olmstead, Stephen held leadership positions at trading pioneers ITG and Macgregor. He architected and ran the ITG Net business unit, the firm's end-to-end electronic trading and trade processing network, building it to a community of over 750 buy-sides, sell-sides, custodians, and industry utilities. Stephen led Macgregor's Sales and Service, and oversaw the transformation of the firm's financial profile by diversifying revenue, growing recurring revenues, and reducing costs dramatically. A recurring theme through his professional experiences is the weaving together of strategy and execution, business and technology. A graduate of Georgetown University, in his free time you can find Stephen enjoying time with his wife and three children, around a baseball diamond or on a stand-up paddle board. Stephen holds the Chartered Financial Analyst (CFA) designation.